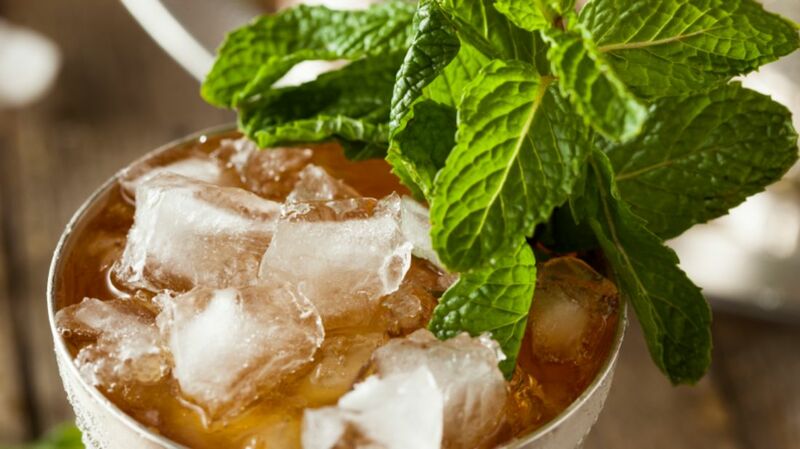 With the Kentucky Derby coming up on Saturday, there’s no better time to enjoy its official drink, the mint julep. But the cocktail's history dates back long before the Kentucky Derby was even conceptualized. According to David Wondrich's cocktail history book Imbibe!, the first known record of a julep is from the Kitab al-Mansuri, a Persian medical text dated to around 900 CE. However, the julep that the author included in the Kitab al-Mansuri looked much different than the modern favorite (it was also written as julāb). It was a medicinal drink made by soaking violets with sugar in water. "Julep" pops up in the historical record again in the 1400s when the book was translated into Latin. The drink was used almost strictly as medicine for centuries. It migrated across the Atlantic with early European settlers making their way to America, along with an herb prized for its medicinal qualities: mint. Around the time it hit the U.S., things changed a bit. In the 18th century, people started drinking it recreationally as well as medicinally, but we wouldn’t recognize those tipples as a modern julep. First off, they would’ve been made with whatever spirit was locally available. Before the Civil War, Southern juleps were likely made with fruit brandy. In Maryland, the julep was (and still is) made with rye whiskey. Elsewhere, it would have been made with rum or rye or moonshine or pretty much any available booze. The drink would be sweetened with honey, sorghum syrup, or any other available sweetener. Since mint wasn’t available year-round, it would have been a seasonal drink. As the story goes, bourbon’s role as the go-to base for the julep was cemented by Kentucky Senator Henry Clay. Clay is famous for a number of things, not least brokering the “corrupt bargain” that secured the 1824 presidential election for John Quincy Adams. The Kentucky senator also mixed his mint juleps with his state’s native spirit, and he is credited as the bourbon mint julep's founding father. The mint leaves, fresh and tender, should be pressed against a coin-silver goblet with the back of a silver spoon. Only bruise the leaves gently and then remove them from the goblet. Half fill with cracked ice. Mellow bourbon, aged in oaken barrels, is poured from the jigger and allowed to slide slowly through the cracked ice. In another receptacle, granulated sugar is slowly mixed into chilled limestone water to make a silvery mixture as smooth as some rare Egyptian oil, then poured on top of the ice. While beads of moisture gather on the burnished exterior of the silver goblet, garnish the brim of the goblet with the choicest sprigs of mint. Lightly press (don’t smush!) the mint leaves against the inside of a silver julep cup so that you can smell the mint. Add the simple syrup. Fill the glass halfway with cracked ice, and pour the bourbon over the ice. Stir until the glass starts to frost over. Add more ice and stir again. Garnish with a mint sprig and serve with a short straw.